NB: No piracy and no asking for cracks and keys! You guys have any query feel free to ask me! I will try my best to answer them. This post will be dedicated for all tricks for mobile(nSeries) and awesome free wares..
Hope you guys enjoy..Please post your comments! Lets start with something from of beloved google! Gmail for mobile devices is fast and easy to use, with the same functions and look and feel as Gmail on the web. Once installed on your mobile device, you're just a click or two away from the messages in your Gmail inbox. Your Gmail account stays synchronized whether you access it from your PC or your phone. Send an email from your mobile device and you'll find it in the 'Sent Mail' folder on your PC. Gmail for mobile devices allows you to search through your entire Gmail archive in seconds. Simply click on the search menu option and input your query. New! Sync your phone's mail client inbox with IMAP. 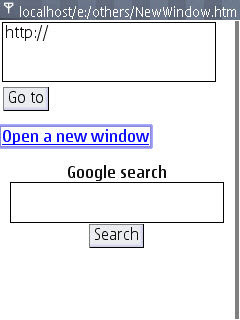 Multiple tabs for mobile browser(nseries browser)! For the other n series devices too multiple windows on high speed wifi/3G connections is something practical. 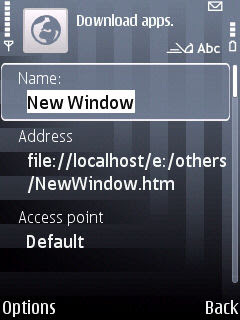 The attachment is a .htm file which can be used to open new windows. Just set it as you homepage from the settings in the browser and click on the “Open a new window” link to open upto a maximun of 5 windows. It also features direct Google search field and a goto box. If you want you can edit it according to your requirement on your Pc using notepad! - To set this up, copy the file to E:/Others with a file manager or any way you choose. - Lauch the browser and select Options>Bookmarks>Add a Bookmark. - In the address type “file://localhost/e:/others/NewWindow.htm” and save the bookmark. - Load the bookmark, goto Settings>General>Homepage and select use current. Thats it, next time you load the browser this will be displayed. You can also press ‘9′ for the default goto option which remembers history.